Dropshipping is an e-commerce model that many an astute online entrepreneur has considered. It is a very popular method of making money from home, and for many yields impressive results. So, unlike a standard retail store, the drop shipper never actually stocks or owns inventory. Rather, the drop shipper purchases it directly from a wholesaler or manufacturer on a needs basis to fulfil orders. The profit that you make is the difference between what you charge your customers on your website and what the drop shipping company charges you. 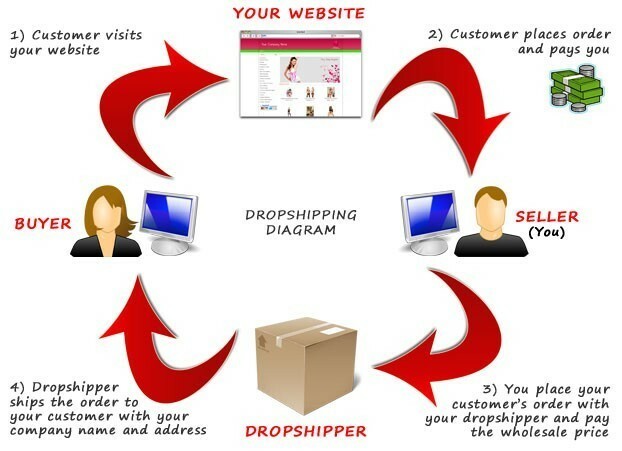 Drop shipping is a legal and successful business model. It is not growing as rapidly as affiliate marketing, but it is certainly something that will continue to thrive. Like all things, there are advantages and disadvantages to the model. Very low start up cost. All you need is an online store and knowledge of how to do it. The ability to offer a very large range of products without ever purchasing any inventory up front, and managing that inventory. You only purchase the product once you have made the sale and have been paid by the customer. It represents a very easy way for you to diversify your product lines and add new products whenever you want. You can run your business from anywhere, provided you have an internet connection. There are no retail outlets or warehouses to be concerned about. Low risk – without the costs of inventory and stores or warehouses, the risk associated with starting an online store is very low. If things don’t work out, you are not stuck with leases and unsold inventory. You don’t need to be concerned with many manual aspects such as packing and shipping orders, tracking inventory, handling returns and inbound shipments, and managing stock levels. It is easier to scale than a traditional business. By leveraging drop shipping suppliers, much of the increased work will be done by suppliers allowing you to grow with not as much hassle as a traditional business. The margins can be very low. Drop shipping represents a very easy way to get started with minimal overhead cost, and as a result it has become a highly competitive niche. The margins for drop shipped products can be slim, making competition with manufacturers and retailers with low margins difficult. There is a lack of brand control. Because someone else is handling and shipping the products on your behalf, you have little control over the brand experience. If you are sourcing your products from multiple suppliers, and they in turn are supplying multiple merchants, it is likely at some point you will experience inventory issues. The suppliers will have fluctuating inventory and you may need to integrate technology solutions to ensure you don’t run into problems. Depending on the supplier, the technology may not always be supported. Complexity of multiple shipping arrangements for one buyer can represent an issue. Let’s say your buyer purchases several items from you in the one transaction. All of these items are sourced from different suppliers, and therefore each have a shipping cost attached. It is not a good look to pass all of these shipping costs on to your customer (after all, they have only made one transaction from you). They will think your shipping charges are astronomical and will likely either cancel the sale, not return to your site, and leave you a bad review. If your drop shipping supplier mucks up the order, guess what? You need to take responsibility for it. If the supplier sends a product that is poorly packaged and gets damaged during shipment, it reflects poorly on you. If they send the wrong product – your fault. If the product is poor quality – your fault. You can see that are lots of things to consider when it comes to drop shipping. While there are clear advantages, there are also disadvantages that need to be weighed up. It is important to note that a manufacturer may not be a drop shipping supplier. In some cases a manufacturer will only manufacture the products being purchased. Some manufacturers will also have a drop shipping program in place allowing you to partner with them directly. This is your ideal scenario. Another term you should become familiar with is a drop ship aggregator. They essentially partner with hundreds of manufacturers making it very easy for you to add products to your store, and reduces the problem of multiple shipping fees. Even though you will be paying fees to these companies if you want them to be aggregator partner with you, they will need to approve you to ensure that they are comfortable that you will be a good brand ambassador for them. There are also drop shipping aggregators that do not integrate, which means they don’t integrate with your online store. They will still provide you with regular reports that you will need to upload into your site. Their membership fees will be lower, but there is more manual work for you to do. Dropshipping directories are companies that essentially offer lists of verified dropshipping wholesalers, including their product information and contact details. They basically take the work out of you having to find them and research them yourself. It is up to you to contact the dropshipping wholesalers once you have identified them as someone you want to do business with. It may hold less appeal for those who are wanting larger margins, and those who are very much focused on the whole of brand experience as there are things that will be outside of your control with respect to brand experience. It is recommended that you if you go down the dropshipping route, you remain specialised in a niche. By narrowing your focus it is easier to find your customer and target your marketing. You can make real money online using dropshipping as a business model. It is a legitimate work from home business, with a very low start up cost and low barriers to entry. As far as great ways to make money from home, drop shipping gets the thumbs up. You will need to research it very thoroughly though, determine whether you want to use an aggregator, and be prepared to put in the work. My preferred e-commerce model is affiliate marketing, although dropshipping can be profitable and very lucrative if you get it right. Leave me a comment or tell me about your experiences below. If you leave me a question I’m happy to help.